The Conjuring 2 begins with a cold open which does a quick job of portraying some of the infamous Amityville case which made the real life paranormal investigators Ed and Lorraine Warren so famous. The Warrens, played by the ever reliable Patrick Wilson and Vera Farmiga, are the focus of director James Wan’s The Conjuring films, but this new film doesn’t concern itself too greatly with this high profile case, but the one that followed it in the UK. Whilst Wan relocates to the UK, specifically Enfield, for the sequel to his excellent 2013 feature, there isn’t a great deal different about The Conjuring 2, aside from a few minor tweaks. There is still the high level of craft in the filmmaking, audiences will be thoroughly unnerved and jumping in fright throughout, there’s the same level-headed approach to the plotting with regards to escalation, the same great focus on characters and another collection of superb performances from actors willing to convey nuanced emotion and go all in when the more extreme scenes demand it. At the centre of all of this are Wilson and Farmiga, who are both incredibly charismatic and really make you actually care about them; but the family at the centre of the Enfield haunting also bring a great deal to the table. Frances O’Connor as the frequently cracked and not quite holding it together mother Peggy is particularly impressive and the script – credited to Wan and three others – does a lot to help us understand what she is going through. Particularly with regards to the doubt that she encounters from a lot of people, including even the Warrens. Skepticism doesn’t exactly feature highly in the Wan’s The Conjuring series though; Wan appears very much to be a believer in “the paranormal” and the one character who seems the most unsure of the family’s story is presented very much like they’re somewhat ridiculous for thinking this way. Within the logic of the film, though, which is described twice as being based on a “true story”, poltergeists and demons are real and we see them on multiple occasions. This is perhaps the one thing that lets down The Conjuring 2, as Wan has decided to lean more heavily on physical manifestations than he did in the first film, including a “Crooked Man” ghost that certainly pushes things too far. Thankfully this is not a great issue and for the most part the film relies on some really smartly chilling and scary moments that use all the visual tricks Wan and cinematographer Don Burgess have at their disposal. The first film worked so well thanks to Wan’s mastery of negative space and playing around with the difference between what the characters see and what we see, and The Conjuring 2 continues in this vein, including one electric sequence in which Ed questions the possessed Janet Hodgson (Madison Wolfe). The conversation is shot without an edit and with Ed facing away from Janet and towards the camera. We can see Janet in the background, but she is out of focus. As the scene builds and builds, a change occurs in the image we are seeing. We won’t spoil what it is, but it’s unsettling and really sets your pulse racing. And it works because of the way in which Wan has executed it. It’s also an interesting and somewhat unusual approach that highlights the way in which Wan – despite the ’70s setting of the two Conjuring films and some occasional cribbing – isn’t just interested in homaging horror films that have gone before. He’s not just someone who borrows the cinematic language of past masters, he instead uses classical filmmaking very well but with a sprinkling of new or slightly surprising choices here and there. A Technocrane establishing shot of the Enfield home, for instance, beautifully tracks in before moving throw a window and then around the home. There are almost certainly a few concealed edits, but the sequence looks on the surface like a single shot and it brilliantly introduces us to the characters and most importantly, the spaces in this home. We understand the geography in just a few seconds, something that will be crucial as the film begins to ramp up and the hauntings begin. Wan’s visual tricks don’t all work, though, as a later shot that takes a “god’s eye view” highlights, but these are minor issues really when one looks at the film as a whole. Much like The Conjuring, this sequel features such an engrossing story too, that any slight misstep, such as a goofy physical manifestation, an excessive camera move or the film’s on-the-nose music cues, fades away as you are gripped by everything happening around it. And the heart of the story resting on investing in the characters – as we did with the first film – pays dividends on this front. One interesting aspect that was also present in The Conjuring but this time is brought more to the forefront is the film’s political subtext, which here focuses on the Hodgson family. Peggy is a single mother and is heard on the phone struggling to get child support and the council house in which the family lives is desperately in need of repair, with the impressively dilapidated production design from Julie Berghoff telling a story all by itself. In perhaps the most chilling moment ever committed to film, the evil spirit haunting the house turns the television that Janet is watching to a speech by Margaret Thatcher, further drawing this connection to the time in which the Hodgsons live and what the current situation is like for families like Peggy’s. 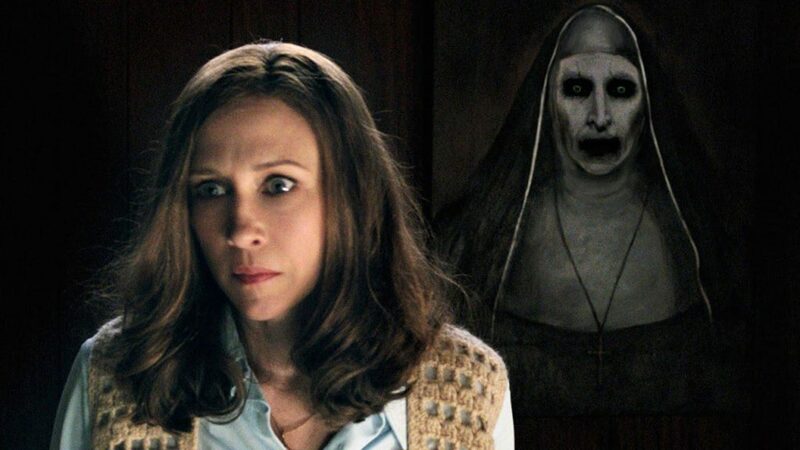 A fine sequel to an excellent horror film, The Conjuring 2 marks Wan’s return to horror after a brief time in which he said he was done with the genre. If The Conjuring 2 is anything to go on, though, one can only hope that the pull of horror and the Warrens will be too great yet again. This review was originally posted at MyMBuzz.